The tight Texas House District 105 race between Republican state Rep. Rodney Anderson and Democratic challenger Terry Meza is headed for a recount. Meza trails Anderson by 69 votes, according to the latest Dallas County elections office tally. The Secretary of State’s office today approved Meza’s request for the recount, which is scheduled for Nov. 28. “I’m cautiously optimistic and just feel like we owe it to the voters when we say, ‘Every vote counts,'” Meza said Monday. The current vote difference is less than one-fifth of a percent of the 47,369 ballots cast. But this eastern Dallas County district that covers parts of Irving and Grand Prairie is no stranger to close contests. Former State Rep. Linda Harper-Brown famously held on to the seat in 2008, when she beat a Democrat by a mere 19 votes. That race also went to a recount and prompted a series of lawsuits that stretched the contest into December. But the race had higher stakes eight years ago: Harper-Brown’s eventual victory gave Republicans a narrow 76-74 majority in the lower chamber. Now, Republicans hold a comfortable majority in the 150-seat chamber regardless of who wins this seat. See here for the background. Meza actually made up about half of her initial deficit with the overseas and provisional ballots, which is impressive in and of itself. I seriously doubt the recount will change the current margin, however. Since I started blogging, there have been three legislative races closer than this one that went to a recount (and in two cases to an election contest heard in the House) without the result changing: Hubert Vo in 2004, Donna Howard in 2010, and the aforementioned Linda Harper-Brown in 2008. I strongly suspect that Rodney Anderson will prevail, and will face an even stronger challenge in 2018. The big news on the Democratic side is the close loss by longtime Rep. Lon Burnam in HD90, who fell by 111 votes to Ramon Romero Jr. I know basically nothing about Rep.-elect Romero, but I do know that Rep. Burnam has been a progressive stalwart, and it is sad to see him go. His district is heavily Latino, and he defeated a Latino challenger in 2012, but fell short this year. Congratulations to Rep.-elect Romero. Also in Tarrant County, Annie’s List-backed Libby Willis will carry the Democratic banner in SD10 to try to hold the seat being vacated by Wendy Davis. Elsewhere in Democratic legislative primaries, Rep. Naomi Gonzalez, who earned a Ten Worst spot this past session for a DUI bust during the session, was running third for her seat. Cesar Blanco, a former staffer for Rep. Pete Gallego, was leading with over 40% and will face either Gonzalez or Norma Chavez, whom Gonzalez had defeated in a previous and very nasty primary. I’m rooting for Blanco in either matchup. All other Dem incumbents won, including Rep. Mary Gonzalez in HD75. Congressional incumbents Eddie Berniece Johnson and Marc Veasey cruised to re-election, while challengers Donald Brown (CD14), Frank Briscoe (CD22), and Marco Montoya (CD25) all won their nominations. On the Republican side, the endorsements of Rafael Cruz and Sarah Palin were not enough for Katrina Pierson in CD32, as Rep. Pete Sessions waltzed to a 68% win. Rep. Ralph Hall, who was born sometime during the Cretaceous Era, will be in a runoff against John Ratcliffe in CD04. All other GOP Congressional incumbents won, and there will be runoffs in CDs 23 and 36, the latter being between Brian Babin and Ben Streusand. I pity the fool that has to follow Steve Stockman’s act. Some trouble in the Senate, as Sen. Bob Deuell appears headed for a runoff, and Sen. John Carona appears to have lost. Sen. Donna Campbell defeats two challengers. Those latter results ensure the Senate will be even dumber next session than it was last session. Konni Burton and Marc Shelton, whom Wendy Davis defeated in 2012, are in a runoff for SD10. Multiple Republican State Reps went down to defeat – George Lavender (HD01), Lance Gooden (HD04), Ralph Sheffield (HD55), Diane Patrick (HD94), Linda Harper-Brown (HD105), and Bennett Ratliff (HD115). As I said last night, overall a fairly tough night for Texas Parent PAC. Rep. Stefani Carter (HD102), who briefly abandoned her seat for an ill-fated run for Railroad Commissioner, trailed Linda Koop heading into a runoff. I’ll have more thoughts on some of these races later. I’d say the “establishment” Republican effort to push back on the Empower Texas/teabagger contingent is at best a work in progress. May open an opportunity or two for Dems – I’d say HD115 is now on their list in a way that it wouldn’t have been against Rep. Ratliff – but barring anything strange we should expect more of the same from the Lege in 2015. In the other parts of the map, redistricting plaintiffs contend that the Texas Legislature intentionally diluted African-American and Hispanic voting strength by fragmenting cohesive communities. This fragmentation, they argue, is especially pronounced in the DFW Metroplex, where the court-drawn interim map (Plan H309) adopted the Texas Legislature’s map (Plan H283) without any changes. 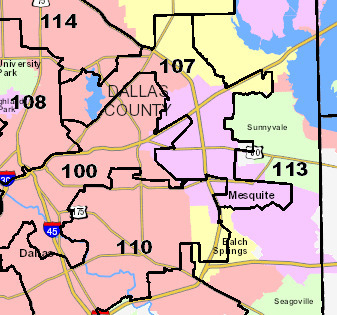 For example, prior to the 2011 round of redistricting, HD 101 was a compact district in eastern Dallas County, taking in all but small parts of Mesquite plus the adjacent town of Sunnyvale and heavily African-American and Hispanic Balch Springs. However, under the plan adopted by the Legislature and incorporated by the court into its second interim map, the city of Mesquite was split into three districts, with part of the city’s non-Anglo population drawn into HD 107 and other parts drawn into HD 110 and HD 113. The city of Balch Springs, where non-Anglos now make up nearly 75% of the population, was similarly split. 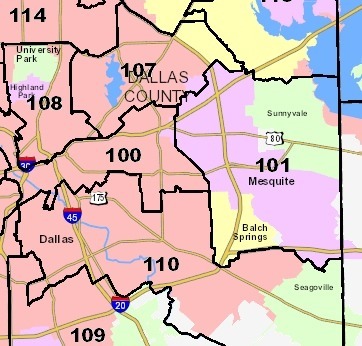 On the other side of Dallas County, the oddly shaped taproot in the redrawn HD 105 is another example cited by the plaintiffs of fragmentation. The portions of the city of Grand Prairie to the west of the taproot include African-American neighborhoods separated out from African-American neighborhoods within the taproot. 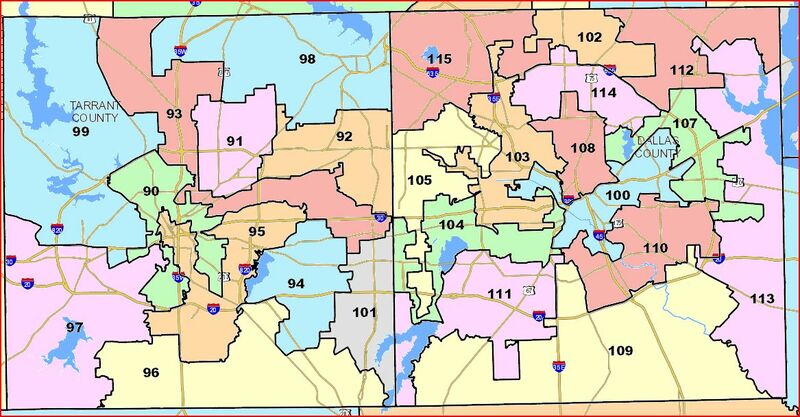 The result is that HD 104, a Hispanic opportunity district represented by State Rep. Roberto Alonzo, becomes 19.2% African-American CVAP, while HD 105, a seat represented by an Anglo Republican Linda Harper-Brown, becomes several points less African-American than under the court’s initial interim map. The plaintiffs’ pleadings point to other examples of fragmentation in Harris, Fort Bend, Bell, and McLennan counties. The plaintiffs say this “purposeful fragmentation of minority voters … violated the equal protection principles laid down” by federal courts. If the court agrees, it would have broad power to fix the fragmentation, much as it fixed similar fragmentation in the congressional map by creating CD-33 in the Metroplex. This was part four of a series looking at the remaining disputes with the maps – see here, here, and here for the first three, here for Part Five, and click over for more on the legislative maps. The San Antonio court will hold a hearing today to begin to decide what to do with the legislative and Congressional maps, once they have direction from SCOTUS. The idea of making the interim maps the legislatively-passed maps is that it would strengthen the state’s hand in defending them, since these maps were drawn by the court in the first place. But the San Antonio court, which originally drew maps that were much friendlier to the Democrats, were constrained by a SCOTUS ruling that said they had to give deference to the original Lege-drawn maps. With the DC court’s ruling that there was intentional discrimination in these maps, I don’t think the hastily-drawn interim solutions will hold up. But I’m not a lawyer, so what do I know. Point is, we’re nowhere near the end of this fight. Dallas and Tarrant Counties will each have eight districts drawn to elect Republicans in them. For this entry, I’m going to look at each of these districts. First up is Tarrant County, which gains a district (HD101) for a total of eleven. 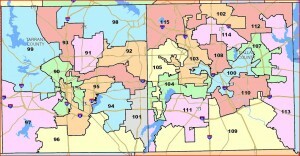 HD101 was drawn to elect a Democrat – Barack Obama received 61.59% of the vote, and no Democrat received less than 60%. The interesting question is what kind of Democrat it will elect. According to the district information, HD101 has a voting age population of 29.5% Anglo, 27.0% African-American, 32.5% Hispanic, and 11.6% Other. (Yes, I know that doesn’t add to 100%. I’m just telling you what it says.) VAP is not the same as Citizen Voting Age Population, however, and in general the Hispanic number will drop a lot more for that than other demographic groups. As such, if I were a betting man, I’d wager on African-American. But don’t be surprised if he or she gets a primary challenge from a Hispanic candidate before the decade is over. None of these stand out as obvious pickup opportunities. Both HDs 93, which had been won by a Democrat in 2006, and 96, won be a Dem in 2008, were made redder to protect their new and recycled incumbents. I suspect that what looks safe now may not be in a couple of cycles. As Tarrant County got less white over the past decade, it also got less red. I don’t think either of those trends are likely to reverse themselves. It’ll be very interesting to see what the landscape looks like for the 2016 election. I’m not sure what the deal is with the Truitt and Geren districts, but those numbers sure do stand out. Both districts 93 and 96 were made redder, though the latter only in comparison to what it would have been with no changes. Basically, the creation of a 60%+ Dem district in the county gave mapmakers a lot of room to spread the Republican population around enough to make sure no one was in any imminent danger. You can’t fight demography, but you can delay it a bit. Driver was paired with freshman Cindy Burkett (HD101), and Harper-Brown with freshman Rodney Anderson (HD106). Here in a county that’s ten to fifteen points bluer to begin with, the most Republican district is bluer than the swingiest district in Tarrant. It ain’t easy making 57% of the legislative seats Republican in a county that’s 57% Democratic. Here the question isn’t if some of these seats will be ripe for the taking but when. Anywhere from two to six seats could be vulnerable right away, and for sure all of them need to be strongly challenged. While we have seen individual districts that are bluer, there’s no one place that has as many opportunities for gain as Dallas. Every district is bluer than it once was, some by ten points. Some day Dallas County will look like Travis. It’s already most of the way there. Next up, Harris County. My guess is that they ultimately won’t do anything this session, but it’s good to see the matter discussed by the Ways and Means Committee. If nothing else, it may lay the groundwork for a future session. House Bill 1317 by Rep. Elliott Naishtat, D-Austin, and House Bill 2403, by Rep. John Otto, R-Dayton are aimed at finding ways to force Amazon and other retailers to collect taxes on online sales that involve Texas consumers or so-called affiliate marketers in Texas, who make a commission by steering customers to Amazon’s website. Both bills seek to address what constitutes having a physical presence in the state. Under a 1992 U.S. Supreme Court decision, retailers with a physical presence in a state can be required to collect sales taxes, legal experts say. The committee heard pleas from retailers who said they increasingly can’t compete with online sellers who don’t collect sales tax. A fiscal note released Monday from the Legislative Budget Board projected that Naishtat’s bill would have no significant affect on the state budget, because it anticipates “major online retailers” would cancel their agreements with Texas affiliates. Otto said his bill would establish a “fair and equitable” system by clarifying what constitutes a physical presence in the State of Texas. The fiscal note on Otto’s bill projects that the state would collect an additional $6 million in 2012 and $10 million in 2013, rising to $18 million in 2016. Noticeably absent from the hearing docket was House Bill 2719, a pro-Amazon measure filed by state Rep. Linda Harper-Brown, R-Irving. That bill would amend the state tax code to say that a company can’t be classified as a retailer required to collect sales tax if it, or a subsidiary, operates or uses “only a fulfillment center … or a computer server” in Texas. I’ll say again, I think the ultimate solution to this is Congressional action. The original justification for exempting online retail from sales taxes has long been obsolete, and is now a real drag on local and state governments. One way to force Congressional action is for a bunch of states to implement their own solutions, thus making the case for a single standard to be applied. I don’t expect Texas to do anything about it now, but I believe it will eventually. The Lege weighs in on Amazon, with opposing bills. House Bill 2719, filed [Wednesday] afternoon by state Rep. Linda Harper-Brown, R-Irving, would favor Amazon’s efforts to avoid collecting tax for online sales by amending the state tax code to say that a company or individual can’t be classified as a retailer if if they — or a subsidiary or affiliate — operate or use “only a fulfillment center… or a computer server.” The bill defines a fulfillment center as “an establishment in this state at which shipments of tangible personal property are processed for delivery to customers.” The bill would also exempt a company meeting those criteria from having to give any state agency information about purchases made in Texas. That measure is directly at odds with House Bill 2403, filed Monday by Rep. John Otto, R-Dayton, which aims to close loopholes in the Texas tax code that Amazon could use to support its claims that it doesn’t have to collect sales tax. Otto said his bill is intended “to clarify the meaning of Texas law to prevent Internet retailers from evading tax liability that, to me, is established under current law.” Otto said he has talked with Sens. Steve Ogden, R-Bryan, and Tommy Williams, R-The Woodlands, about drafting a companion bill in the Senate. Here’s HB2719, here’s HB2403, and here’s some background on this. I like this development for two reasons. One, Harper-Brown is going to be vulnerable next year pretty much no matter what happens in redistricting, and I’d rather have her on the wrong side of an issue like this. A little extra ammunition never hurts. Two, Otto is a Norquist disciple, so if he’s on board and recruiting Senate allies that strikes me as being a great omen for success. I’ll be keeping an eye on this. Reps. Joe Driver and Linda Harper Brown made it through the election and now just have to worry about what a prosecutor might think. The Travis County district attorney’s office is looking into Driver’s travel reimbursements. An official there last week said he couldn’t comment on whether Harper-Brown’s use of a 2010 Mercedes-Benz E550 was being investigated. Kathy Colvin, a spokeswoman for the U.S. attorney’s office in Dallas, said she couldn’t comment about whether her office was looking into either Driver’s or Harper-Brown’s actions. Driver and Harper-Brown did not return phone calls seeking comment last week. Dallas County Republican Party chairman Jonathan Neerman said it’s too soon to tell whether either of the lawmakers will face future political repercussions. Cal Jillson, a political science professor at Southern Methodist University, said Driver and Harper-Brown will likely be in the clear if authorities don’t conclude they did anything wrong. Very likely true, though unless they actually get a result that casts doubt on the merit of the initial charges I’m sure they will come up again. But unless they get into more trouble, it will be at most background noise, and could even be an asset for them if they wind up in the clear. Timing is everything in this life. There were eight contested judicial races in 2002, two each in 2004 and 2006, and five in 2008. That year, every Democratic judicial candidate won at least a plurality in HDs 105 and 133; in HD52, thanks to Libertarian candidates getting upwards of five percent, only two of the five Republicans got majorities, with the others carrying the district with pluralities. You look at these numbers and you realize two things: One, what a huge missed opportunity HD105 was last time around. And two, even without the Obama surge of 2008, there was a lot of Republican erosion in those districts. In 2006, the Democratic judicial candidates ran ahead of their statewide numbers in HD52, as the WilCo Democratic Party was starting to get its act together. Both HDs 105 and 133 showed the effect of non-Presidential year turnout – remember, even as Dallas Democrats were sweeping the county that year, it was almost entirely about a huge decline in Republican votes. It’s all about changing demographics. I have no idea what things might look like this year, but I know you can’t overlook that effect. Combine four more years of such change with better organization and the Democrats in these districts have a fighting chance. If it’s not your car, why did you get mileage reimbursements on it? The Back to Basics PAC has more questions about “Linda Harper-Benz”. Remember our prior post on the scandal about how State Rep. Linda Harper-Brown was caught driving a brand-new 2010 Mercedes-Benz ME550 Sedan that was given to her by a state contractor, Durable Enterprises Ltd.? We’ve discovered shocking new information on the scandal surrounding Harper-Benz. Apparently State Rep. Linda Harper-Brown billed the Texas Comptroller for $13,000 in mileage reimbursement funds. Now, this wouldn’t be a problem if the mileage reimbursement funds were used on her privately owned cars. However, she has three cars that were given to her by Durable Enterprises, Ltd., and Texan taxpayers have a right to know whether taxpayer funds were used on these cars that weren’t even legally hers. This is based on a post by John Coby, who found the records from the Comptroller’s office that documented the reimbursements. Follow the links and see what they found. Back to you, Linda. I guess they weren’t terribly impressed by her video defense against the hand in the cookie jar accusations. It’s going to be tough to top Rep. Linda Harper-Brown, R-Irving, and her YouTube response to a Dallas Morning News/WFAA-TV report about the 2010 Mercedes-Benz E550 she drives that is owned by a firm that has millions of dollars in state transportation contracts. Harper-Brown is on the House Transportation Committee. And, FYI, her husband also drives a vehicle owned by the firm that provided her Mercedes. Both vehicles feature State Official license plates. If you watch one YouTube video in your lifetime, please make it this one. There are no kitties playing the piano, but you’re going to love the Harper-Brown performance at http://tinyurl.com/3y47ch8. If that’s the response she’s going to get for her efforts, then it’s going to be a long summer for Harper-Brown. The DMN is less snarky but still critical, while Lone Star Project, Harold Cook, and the badly missed Pink Dome have more. State Rep. Linda Harper-Brown (R-Irving) and her husband are driving cars owned by a highway contractor doing millions of dollars of business with the state. All the while, Harper-Brown sits on the influential House Transportation Committee. Her husband claims the deal is pay for work he does separate from his wife, but others question the arrangement. Harper-Brown lives in a modest house in Irving that has been appraised at $132,000, yet she drives a 2010 Mercedes Benz sedan valued at about $55,000. She and her husband own the house, but not the car. State records show since her 2002 election, Harper-Brown has driven cars purchased by Durable Enterprises Equipment, a company owned by Jeffrey Bryan, of Arlington. Bryan also owns Durable Specialties in Grand Prairie and Paradigm Traffic Systems in Arlington. The state comptroller’s office shows that over the last three years, they’ve done $12 million in work, like installing and managing highway cameras, for TxDOT. In one campaign picture, Harper-Brown can even be seen wearing a Durable Specialties jacket as she stands next to Bryan. Earlier this year, former State Representative Terri Hodge was sentenced to a year in prison for accepting reduced rent and home improvements in return for official favors – less in compensation than it appears has been received by Linda Harper-Brown (Dallas Morning News, June 16, 2010). If it is proven that Linda Harper-Brown was given use of the car(s) in return for her actions as a legislator, she will be guilty of bribery. That’s a big “if”, of course, though the WFAA story notes that information has been turned over to the U.S. Attorney in Dallas and state prosecutors in Austin. Even if there is something there, I would not expect any action until after the election, as that is the norm in these situations. Harper-Brown’s unpersuasive response is here, and BOR has more. State Rep. Linda Harper-Brown admits that voter ID legislation has nothing to do with the facts. Of course, we do have a pretty solid grasp of how many uninsured children there are in Texas (many, many, many) and for that matter we have a good idea how many allegations of election fraud there have been that involved people showing up at a polling place to vote as someone other than themselves (very, very few). But I’m glad to see Rep. Harper-Brown admit for the record what most of us have known for a long time, that voter ID legislation has nothing to do with things like facts and evidence. BOR has more. The bicyclists will not go away despite the setback on the Safe Passing bill. A state legislator’s unsuccessful efforts to pass a “safe passing” bill for cyclists said Wednesday that an accident involving her granddaughter has renewed her interest in the issue. Rep. Linda Harper-Brown, R-Irving, sponsor of a bill to protect bicyclists, expressed relief Wednesday that her granddaughter and a friend suffered only minor injuries after getting hit by a SUV. Gov. Rick Perry recently vetoed legislation that Harper-Brown plans to push again next session to protect vulnerable road users. Her granddaughter, Bethany Harper, 16, along with three friends and Bethany’s father, Timothy Harper, were cycling near Kaufman Tuesday evening when a motorist turned into two of the cyclists, whom the driver said she did not see, according to the state legislator. Her granddaughter suffered cuts, bruises and contusions, and a friend had a shoulder separation, Harper-Brown said. Both of their bicycles were ruined. “The first thing that went through my mind was, had this bill become law maybe people would be more aware and a little more careful when they are driving around bicyclists,” Harper-Brown said. We are proud to announce our endorsement of Loretta Haldenwang for State House District 105 in Irving. Loretta currently serves as the External Affairs Director of the Greater Dallas Hispanic Chamber of Commerce and is respected by community, business and political leaders alike. Loretta spends each day working in her community to promote small business successes, better schools and scholarship opportunities, access to affordable healthcare, common sense transportation solutions and more. She is also no stranger to the proceedings of the Texas House of Representatives after working for two legislative sessions for Rep. Joaquin Castro (D-San Antonio) as a District Director and Legislative Analyst. 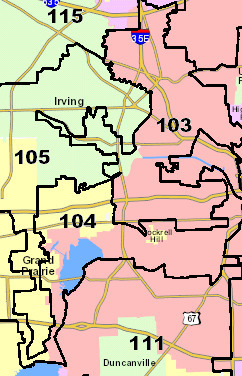 House District 105 sits in the Northwest corner of Dallas County and includes almost all of the City of Irving. It is currently represented by an eight-year incumbent Republican named Linda Harper Brown. However, after nearly losing to an underfunded perennial candidate in 2008, reliable Republican sources have leaked that Linda has been told by the Republican leadership that it is time to retire. The self-described anointed replacement is Irving Republican Councilwoman Beth Van Duyne, a well-known far-right extremist with a colorful record on the council. Like many urban-suburban districts that we have won in the last 4 years, House District 105 has a rapidly evolving demographic composure. Now a majority-minority seat, Democrats have performed better on the ballot every election cycle. However, in a low-turnout mid-term election, we will need a well-funded, professionally run campaign with a candidate who can relate to all Irving residents. We have no doubt Loretta is that candidate. And as the daughter of a neurologist and a microbiologist, she is no stranger to setting ambitious personal goals and working hard to make them a reality. She is an impressive and articulate woman who possesses the skill set, savvy and stamina to be our endorsed candidate in House District 105. She sounds like a great candidate, for whom there is already an Act Blue page, if you feel moved to take action. She’s also apparently not the only candidate for that seat. All I can say is that I hope we get a candidate everyone can support for HD105 this time around. No repeats of 2008, please. Rep. Todd Smith, the Republican chairman of the House Committee on Elections, confirmed today he’s intending to have the committee vote Monday on a voter ID plan. The twist: Smith is backing off his attempts to rewrite the plan. Bowing to a request from two GOP colleagues, Smith simply intends to seek the committee’s approval of the Senate-approved version of Senate Bill 362. Presuming the five Republicans on the committee stick together, this means that barring unforeseen hang-ups, a clean version of the Senate plan will ultimately be taken up on the House floor. The colleagues, Reps. Betty Brown of Terrell and Linda Harper-Brown of Irving, had resisted Smith’s attempts to rewrite the Senate bill. Well, we can’t say we weren’t warned. If there are any unforeseen hang-ups, the bill is dead, since Monday is the deadline for passing bills out of House committees. Which doesn’t mean it couldn’t be inserted as an amendment somewhere, of course, so even if it dies one way or another – has anyone talked to Reps. Tommy Merritt or Delwin Jones lately? – it’s not truly dead until sine die and the threat of a special session passes. UPDATE: As noted in the comments, the Monday deadline is for House bills, so SB362 would be exempt from that. So I daresay the best hope is for it to not pass on the House floor. On Tuesday, the Texas Senate passed the Safe Passing bill on the third reading. Thanks to each of you who contacted your senator: you helped make it happen! Before it passed, Senator Patrick proposed two changes which were adopted in the final version of the bill. First, the safe passing provision would only apply when weather conditions allow. Second, the Senate removed the penalties for harassing and taunting. CTC has concerns over both amendments. The House version of the bill was passed unanimously by the Transportation committee, with two amendments. The first amendment limits the safe passing provision to wider roads. For example, if your car breaks down on a four-lane road, motorists would be required to pass you safely; but if you break down on a two-lane road, they may not be. The second amendment removed the “right hook” provision, which would require a motorist making a right-hand turn to yield to a vulnerable user, such as a pedestrian, before turning. Given the prevalence of motorists turning right while looking left, this provision remains important, and we hope it comes back. The House version has not yet gone to the floor. That means our legislators retain the opportunity to strengthen the bill prior to voting on it. We hope they will. If you agree, be sure to tell your state representative. Please visit this CTC forum thread for legislative updates on the Safe Passing bill. MTB Law Girl has more on the changes made to the House version of the bill. Assuming it passes as well, there will be a conference committee to work out the differences. As always, there’s never a better time than now to contact your legislators and let them know how you feel about bills like this. BikeTexas has more. Never too early to be thinking about these things. “I don’t think it’s a big stretch to say we can do 57 percent [countywide] in 2010,” said Darlene Ewing, chairwoman of the Dallas County Democratic Party. Because of that comfort level, Ewing said, the county party is targeting Dallas County commissioner Precinct 4, held by Republican Ken Mayfield. Mayfield won in narrow victory in 2006, as his Republican-leaning area in western Dallas County continued to see demographic shifts that resulted in more Hispanic voters. Dallas Mayor Pro Tem Elba Garcia, a Democrat, is expected to challenge Mayfield next year. Ewing said Democrats are also eying state House District 105, where last year Republican Linda Harper Brown of Irving held on by 19 votes to beat little-known Democrat Bob Romano. HD105 is a given; it really should have been won in 2008, but that’s water under the bridge at this point. It gets harder after that – HDs 108, 112, 113, and 114 are all within numerical reach, though they all present challenges. If they can find and fund quality candidates, anything is possible. Some defense will be in order as well, especially in HD 101, where the Obama wave was helpful to Robert Miklos’ victory. Beyond that, I sure hope their sights are set a little higher than this. Winning a County Commissioner’s seat is big, but there’s another prize out there that’s just begging for a claim to be put in. I’m speaking about CD32, where Pete Sessions will be operating as the chair of the NRCC in a district that’s trending strongly Democratic – as the Swing State Project documented, where George W. Bush won 64% in CD32 in 2000, and 60% in 2004, John McCain could muster only 53% last year. With the DCCC having already targeted Sessions on the airwaves, and with a lack of any countywide races to take over, why not take aim here? The Dems had a candidate in 2006 who had money but no visible campaign that I could discern, and a candidate in 2008 who ran an active campaign but had little money. Surely in 2010 they could find someone to put both halves of the formula together. Thanks to BOR for the link. MADD wants to make it harder for people with a drunk driving conviction to get behind the wheel. Mothers Against Drunk Driving is again pushing Texas legislators to require ignition interlocks for people convicted of their first driving while intoxicated offense. The ignition interlock device tests a driver’s breath to confirm he or she hasn’t been drinking before the car will start. “We really want to see this on first-time offenders in order to prohibit the third or fourth time down the road,” said Hope Rangel of Humble, executive director for MADD’s Southeast Texas region. Proposed legislation, including bills filed by state Sen. Rodney Ellis, D-Houston, and state Rep. Bill Callegari, R-Katy, calls for the interlock to be installed for offenders convicted of their first DWI who are placed on probation. Two similar measures filed in the last legislative session in 2007 died in committee. Callegari has HB1110. Ellis has SB170, which has a companion bill in the House, HB379 by Linda Harper-Brown. Current Texas law requires interlocks as a condition of probation only for repeat offenders or those with a blood-alcohol concentration of 0.15 in any alcohol-related driving offense. The device also is required for those released on bail while awaiting trial if they are charged with repeat DWI offenses or if they hurt or kill someone while driving drunk. Although the proposed legislation is encouraging, Rangel said, many convicted drunken drivers in Harris County are opting for jail time instead of probation. If an offender chooses to go to jail, no interlock is installed. Drunken drivers put on probation have to pay for the device — which can average about $150 a month — so they might find jail more appealing, she said. Facing the stiff costs and strict rules that come with probation, thousands of convicted drivers in recent years have decided spending time behind bars is the better option. And in a county already struggling with crowded jails, that’s a disturbing trend. Sentences can be short enough to mean losing only one weekend and a vacation day, but some end up behind bars as long as half a year. The choice of jail time also may mean fewer options for treating the alcohol problems that land many drivers there. Of the 6,685 DWI defendants in the county who accepted plea agreements last year, 2,894 (43 percent) took jail time rather than probation, Wessels said. In 2000, fewer than 10 percent (479 of 5,034) chose jail. Last year’s figure, though significant, did represent a drop from 2004, when it reached 52 percent. Robert Pelton, past president of the Harris County Criminal Lawyers Association, attributes the decline at least partly to lawyers not doing all they should for their clients. “I think any attorney is doing a disservice to their client by putting them on probation,” he said. Pelton, a defense attorney for 31 years, said he generally advises clients to take the jail time because probation can be so arduous, financially and otherwise. Probation for DWI carries another risk: If it’s revoked, a judge can pile on even more jail time than originally would have been ordered. This, added to the fact that Harris County has the highest per capita rate of probation revocations in Texas, means it may make more sense to burn some vacation time behind bars, Pelton said. Grits blogged about this at the time. It’s yet another reason why Harris County’s jails are overcrowded. It seems to me that if we got serious about this problem and removed some of the perverse disincentives for choosing probation, we could accomplish MADD’s objective without the need for new legislation and do a lot of good for the criminal justice system and the taxpayers of Harris County. Of course, that’s hard work, and passing a new law is comparatively easy. Point is, we could have already achieved this goal, without needing to wait for another opportunity in the Lege. By the way, the story notes that installing the interlock can already be a condition of bail or probation. It might be nice to know why it’s only done sometimes and not as a matter of course before we require it. Research suggests lawbreakers with prior DWI convictions are a serious problem. MADD claims such offenders comprise nearly one-third of the alcohol-related dangers on the road. Last year, Texas had 124,662 residents with three or more DWI convictions, according to the state Department of Transportation. The agency reported 18,271 other Texans had five DWI convictions or more. One person had 22 convictions, the most of any driver in the state, TxDOT said. Drunken drivers involved in fatal crashes were eight times more likely to have a prior DWI conviction than sober drivers involved in a fatality, the National Highway Traffic Safety Administration reported in 2007. Not everyone supports MADD’s proposal. The American Beverage Institute, a restaurant trade association, is urging the Texas Legislature to reject the bills. Well, okay, but one could argue that those hard-core abusers will have a first offense, at which time they will get the ignition lock. For however long that lasts, anyway – the text of the Ellis/Harper-Brown bill only says “The court shall order the ignition interlock device to remain installed for at least half of the period of supervision”, which strikes me as more relevant for probation than for someone who chose jail time. I suppose they’re arguing more money should be put into treatment, and if so I certainly agree. I don’t see how that’s incompatible with this bill, however. The bottom line is that while I agree with the goal of this effort, I have problems with the means being proposed to attain it. Let’s fix what’s wrong with probation first. MTBLawGirl passes on word of a bill that will be of interest to bicyclists. Earlier this month, Texas Senator Rodney Ellis and Representative Linda Harper-Brown filed the Safe Passing Bill in the Senate (SB 488) and House (HB 827) respectively. In addition to requiring more than three feet passing distance when a motorist passes a vulnerable road user, it will include penalties for throwing projectiles, “dooring”, the “right hook” (turning dangerously in front of a vulnerable road user), and more. Vulnerable road users include cyclists, pedestrians, runners, farmers on tractors, motorcycles and more. This bill, specifically the definition of “vulnerable road user” is modeled after similar legislation in Iowa, Illinois, Michigan, Pennsylvania, and Vermont. This is a huge step forward for Texas in actualizing “Share the Road” and reducing fatalities. Sadly, approximately 50 cyclists, 400 pedestrians and 500 motorcyclists are killed every year in Texas. I’m guessing these are the same bills that the Texas Motorcycle Roadriders Association will be lobbying for as well. That suggests to me that there’s a decent chance of passage. If this interests you, click on over to MTBLawGirl and drop her a note.